Stylish and highly versatile, freestanding iPad display stand offers an ideal solution for impressive interactive product presentations at any exhibition, event or showroom. 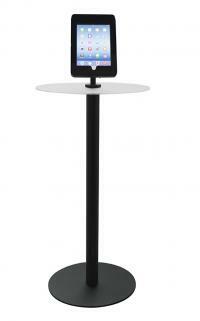 Smart powder-coated aluminium post with a discrete matt black weighted base with rubber feet pads for added stability. Option to add a rollable graphic panel or custom shaped rigid graphic. Frosted acrylic working table top creates a meeting point with target customers. The steel cradle has a secure lock and offers 360 degrees rotation, plus tilt and swivel feature, and is designed to hold iPad 2, 3, 4 and Air. Recess room inside cradle for placing portable charger connecting to iPad (max size 134x73x15mm). Highly protective padded all-in-one carrying bag with graphic tube for easy transportation. Alternative TECHNO iPad Stand without acrylic shelf, graphic set and carrying bag available.